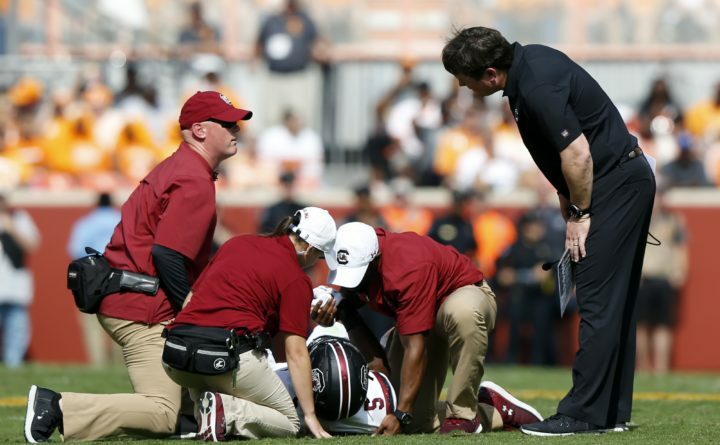 In this 2017 file photo, a University of South Carolina football player is treated after suffering a head injury during a game. “Our goal is to be able to identify individual risk factors for students for prolonged recovery, and in the perfect world allow us to start to understand how we can start to create strategies to reduce concussions,” MCMI director Dr. Paul Berkner said. “The platform we use is very user-friendly and can be used by other school professionals, specifically school nurses, so there are other options for gathering this information in schools that don’t have an athletic trainer,” Berkner said. “The stipend is to value that work, their time and their efforts around improving the health of our youth,” he said. “The goal is to provide schools the tools so they can better manage their own concussions,” he said. “The problem is that each school by itself does not have enough data to be able to effectively look at their incidence and prevalence of concussions,” Berkner said. “Our role here is to be able to collect and look at enough data from around the state so we can actually start reducing concussions.